I've been literally waiting and wanting to try Caviar nail art for the longest time and finally I've had my hands on it. Suitable for professional use or home use! If you've been following me lately then you much I'm not a nail art lover at all but some time back I quite got a fancy for flocking nail art and Caviar nail art. I didn't forget the day when I first tried my nail art stamping kit by Born Pretty. Caviar nail art is something I've been seeing on many blogs and seen on YouTube, but I never dared to try it as I'm drastically bad at creating nail art, but I couldn't stop myself ordered caviar nail art manicure from born pretty store that is a largesr nail supply store selling collection of professional nail supplies and saloon nail art supplies on a largesr scale without making dent in your pocket. A newbie at nail art like me even found these pretty little babies surprisingly easy to work with as an application is SO easy. I had no problem at all getting it done and achieving perfect result in no time. Apply nail polish (the same color as the Caviar beads), wait it dry. Apply nail polish again, then immediately put the caviar beads on your nail, then allow to dry. Tap the nail against hard surface to sweep away excess beads, which can be captured in the accompanying tray. Don't discard it-pour it back into the jar. Overall I'd say I seriously recommend Born Pretty 12 Colors 3D Steel Ball Manicure Glitter Nail Art Decoration to everyone who are into nail art or wants to give a nice 3D twist from those regular glossy, glittered or satin nail finishes. I've tried few other colors and all came out pretty amazing. 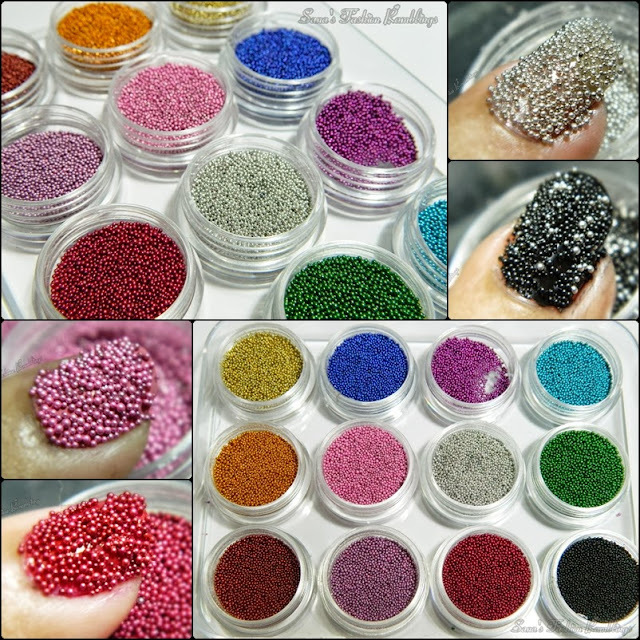 Born Pretty 12 Colors 3D Steel Ball Caviar Beads Manicure Glitter Nail Art Decoration priced $5.41 and can be purchased from Born Pretty Store here. 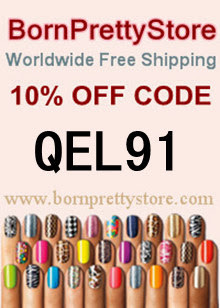 Use code QEL91 to get 10% along with free world wide shipping. Have you tried Caviar Nail Beads Manicure yet? What do you think about it? 65 comments on "Born Pretty 12 Colors 3D Steel Ball Caviar Beads Manicure [Review]"
hello darling! thank you so much for your comment and for following! I'm following you back! This looks awesome! I have some steel balls I want to try but I'm a little scared I'll mess it up! All the colors are so beautiful!! These look great and easy to do. Thanks for the honest review about them not staying on long! My biggest problem with doing my nails is that I am always cleaning something and never fail to destroy whatever work I did on them! I might try these for a special evening out-thanks! I bet you're still finding little caviar beads all over your home after doing this! :) LOL I would be worried about what a mess I would make with all of those tiny beads. The result is so stunning, though! This type of manicure would look so pretty against a simple black dress. Thank you so much babe, just followed back <3 818! if you want also via Bloglovin and G+, just let me know and I'll straight follow you back! pretty. but i would find it annoying when the little beads start falling here and there. oooh, I really want to try these! DO MY NAILS! These are friggin' awesome! Interesting post and cute blog! Thank you so much for the comment on my blog, I'm following on GFC, Bloglovin & Facebook! So bold and dramatic - I just love how these look. Fabulous! Thank you! I follow you now via GFC, Facebook and bloglovin. The nail caviar trend was something I never got into, but wanted to. I'd still love to try a black colour. Thanks for sharing, the colour choices are just lovely!! Oh noes, I'd love it if they can last longer though! Wonderful result! Creative, wouldn´t have thought about this. Wow, colour selection is stunning! Came out really pretty. I've still yet to try a Cavier manicure. Looks awesome! I have never tried Caviar Beads Manicure. not tried this as yet, but will try soon. got the caviar beads. not tried as yet, but will do so soon, i have got the caviar beads. They are so cute and yet so glamorous! I'm now torn between flocking and this amazing caviar beads manicure. Thank you for showing us these babies! I'm torn between the flocking and this caviar beads mani. Great review, awesome images. I'm really into nailart and I love that caviar look on my nails! Really nice post! I've been wanting to try these for a while now, Lol, but never really got the opp. to actually do it. Love the colors and you did a great review, the pics came out wonderful. Love it! I've always wanted to try these nails, but never really got the opp. to do it! Lol, lovely review and your pictures came out wonderful! Caviar mani is sweet and fun! The cobalt blue is great! Very Beautiful & lovely blog,Thanks for sharing. Keep posting like this.